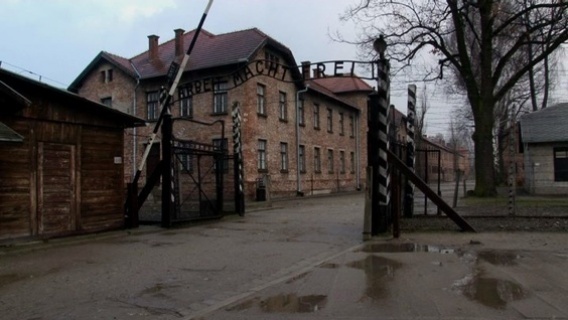 The gate to the main camp at Auschwitz, through which the sick prisoners marched. Exactly 70 years ago tomorrow, on 28 July 1941, an event of great tragedy and great significance took place. The very first Auschwitz prisoners were selected to be gassed. But in a piece of history which symbolizes the complex history of the camp, these prisoners were not selected because they were Jews, and they were not murdered in Auschwitz, but transported back to Germany to be killed. What happened in Auschwitz 70 years ago tomorrow was that the so-called ‘adult euthanasia scheme’ was implemented in the camp. In an action known as 14f13, around 500 sick prisoners – some volunteers, some selected by the Nazis – were marched out of the camp and put on a train to Sonnenstein near Danzig. They had been told that they were being sent West to receive medical treatment and be healed. But at Sonnenstein they were murdered in a mental hospital which contained gas chambers designed to look like shower rooms. We rightly remember the enormous number of Jews who died at Auschwitz – around one million of the one million, one hundred thousand people who were sent to Auschwitz and then murdered were Jewish. But less well remembered are the others who suffered at the camp before the mass arrival of Jews early in 1942. All of those sick prisoners who left Auschwitz on 28 July 1941 were murdered by the Nazis. Your blog is rich with content and very informative. Your readers may also enjoy my book, The Bridge of Deaths. Well, catalina, it sounds like a good read – although I struggle with books that mix fact with fiction. Where does one begin and the other end?